Can children with autism learn more about emotion from robots? This week Alria Williams from the Centre for Research in Autism and Education at the UCL Institute Of Education presented recent work from the DE-ENIGMA project at the CEN seminar. The DE-ENIGMA project is a large European project on robotics and autism, funded by Horizon 2020. 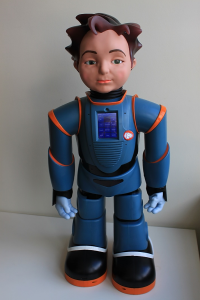 The project consists of many teams, including UCL, working together to develop activities to teach autistic children about emotions, using a humanoid robot, Zeno pictured below. The project was based on the premise that many people with autism have difficulty using and understanding verbal and non-verbal language. This may make it more difficult to understand others and interact with them. On the other hand, robots may be easier to comprehend as they are more predictable systems. Previous research suggests that children with autism may perceive a humanoid robot as being less complicated, less threatening, and therefore be more comfortable to communicate with than humans. Over the past year, the UCL team have conducted studies with children to test the suitability of their learning activities. Yesterday’s talk outlined the numerous studies they have engaged in and discussed the activity design issues that they encountered. During the summer, the DE-ENIGMA team conducted design critique interviews with teachers and presented the key insights and feedback from teachers on suggested ways they could adapt their activity designs to meet the needs of autistic children in the research. Find out more at the DE-ENIGMA website! This entry was posted in Uncategorized and tagged Autism, Emotion by admin. Bookmark the permalink.